Inspired by the Khmer monarch of the same name, the Jayavarman riverboat combines the Art Deco charm of 1930's France with the romance of Indochina. Owned and operated by the Heritage Line, the ship has 27 cabins and is decorated with wood carvings and Vietnamese lacquer paintings. 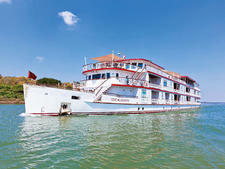 With its sister ship The Jahan, Jayavarman sails three- to seven-night itineraries on the Mekong. For its size, the ship offers high levels of comfort with amenities including a pool on the Sun Deck and a spa. The cabins are divided into three categories. There are 14 Superior staterooms -- four twin and 10 double -- on the Main Deck that measure 226 square feet in total, including the 53-square-foot private balcony that is reached through panoramic floor-to-ceiling glass doors. The airy cabins have white, wooden furniture and are decorated with Asian ornaments and paintings. Located on the upper deck are 11 Deluxe Staterooms -- three twin and eight double, including one connecting cabin -- which each measure 258 square feet (including a 53-square-foot balcony). These cabins are decorated in warm tones with dark antique furniture and a rustic copper sink in the bathroom, which is accessed through a wooden sliding door, reflecting the Indochine lifestyle of the 1930s. 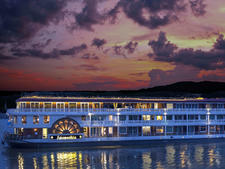 Also located on the Upper Deck are the two Signature Suites: the Bao Dai and the Jayavarman. The Bao Dai, named after a Vietnamese king, is 290 square feet in total, including the 32-square-foot private balcony. A dark wood king-sized bed dominates the suite and the walls are decorated in a soft saffron tone and decorated with local artifacts. 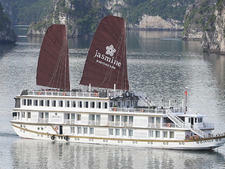 The Jayavarman is a 290 square feet, including the balcony which is the same size as the Bao Dai. The centerpiece of the cabin is a solid wood king-sized four-poster bed and a large piece of artwork at the headboard portraying an Apsara dancer. Public areas include the Henry Mouhot Lounge, named after the French archaeologist who discovered the Angkor temple complex. Decorated in dark wooden furniture with a French-colonial feel, the lounge also houses the reception desk and small shop. The spacious Club 1930 Bar and Funnel Lounge have comfy cane chairs and chaise loungers. Meals are served in the Dining Hall, adorned with antique ceiling lights. Meals, featuring regional and international cuisine, are a mix of buffets and set menus with an open-seating arrangement. 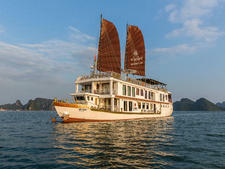 Itineraries features lectures and educational workshops and entertainment, such as Vietnamese and Khmer cooking classes, traditional Apsara dance performances, food and drink tastings, escorted bike rides, cocktails on the sand banks and onboard barbecues. The pool on the Sun Deck also has a whirlpool and the Apsara Spa, tucked away in a quiet area at the front of the ship on the Main Deck, can accommodate up to two people at a time. Treatments include traditional Asian massages and therapies blending Eastern and Western massage techniques. Fares include all meals, tea, coffee, soft drinks and bottled water throughout the day and wine and beer with lunch and dinner, all excursions with English-speaking guides, local transfers to and from the ship, daily tai chi classes, onboard entertainment and complimentary Wi-Fi.